شفیع‌پور یوردشاهی, پریا, کیانی, مصطفی, طباطبائیان, مریم. (1397). نقش طراحی فضای بازی در پرورش خلاقیت کودکان. معماری و شهرسازی آرمان شهر, 11(23), 53-63. پریا شفیع‌پور یوردشاهی; مصطفی کیانی; مریم طباطبائیان. "نقش طراحی فضای بازی در پرورش خلاقیت کودکان". معماری و شهرسازی آرمان شهر, 11, 23, 1397, 53-63. شفیع‌پور یوردشاهی, پریا, کیانی, مصطفی, طباطبائیان, مریم. (1397). 'نقش طراحی فضای بازی در پرورش خلاقیت کودکان', معماری و شهرسازی آرمان شهر, 11(23), pp. 53-63. شفیع‌پور یوردشاهی, پریا, کیانی, مصطفی, طباطبائیان, مریم. نقش طراحی فضای بازی در پرورش خلاقیت کودکان. معماری و شهرسازی آرمان شهر, 1397; 11(23): 53-63. 2استادیار معماری، دانشکده معماری و شهرسازی، دانشگاه هنر، تهران، ایران. جامعه امروز برای انجام فعالیت‌‌های اجتماعی، اقتصادی و سیاسی کشور به تربیت کودکان خلاق نیاز دارد. یکی از عوامل پرورش این امر فراهم آوردن محیطی مناسب برای بازی است. در این راستا ارتباط کودکان با محیط بازی و شرایطی که محیط در حین بازی فراهم می‌آورد، می‌تواند آن‌ها را در جهت پیشرفت رشد فکری و خلاقیت هدایت کند. در این حیطه، پژوهشگران به بازی و اثرات آن بر کودکان پرداخته‌اند، ولی اندکی از تحقیقات به محیط بازی و تأثیر آن در شکل‌گیری خلاقیت اشاره داشته‌اند؛ لذا ﻫﺪف از ﺗﺤﻘﯿﻖ ﺣﺎﺿﺮ، دﺳﺖﯾﺎﺑﯽ ﺑﻪ اﺻﻮل ﻃﺮاﺣﯽ ﻓﻀﺎﻫﺎی بازی ﺑﺮای ﮐﻮدﮐﺎن 3 تا 6 ﺳﺎﻟﻪ (دوره پیش‌دبستان) ﺑﺎ ﺗﺄﮐﯿﺪ ﺑﺮ ﺑﻬﺮه‌گیری از ﻗﺎﺑﻠﯿﺖﻫﺎی ﻣﺤﯿﻄﯽ ﻣﺆﺛﺮ ﺑﺮ ذﻫﻦ و رﻓﺘﺎر ﮐﻮدﮐﺎن و روﯾﮑﺮد ارﺗﻘﺎء ﺧﻼﻗﯿﺖ آﻧﺎن اﺳﺖ. در این مقاله سعی بر آن است که ابتدا تعریف جامعی از خلاقیت و کاربرد آن درطراحی‌های معمارانه با بررسی نکات خلاقانه بیان شود و پس از آشنایی با رشد کودکان در مرحله سنی دوره پیش‌دبستان، ارتباط طبیعت و خلاقیت کودکان مورد بررسی قرار گیرد. علاوه بر طبیعت که مهم‌ترین نقش را جهت پرورش خلاقیت در محیط بازی ایفا می‌کند، به بررسی سایر عوامل ضروری و مؤثر بر محیط بازی و معیارهای اساسی جهت طراحی مناسب در راستای پیشرفت خلاقیت کودکان پرداخته می‌شود. با توجه به پژوهش‌های متعددی که در این زمینه شده است، راهکارهایی جهت طراحی محیط بازی در راستای پرورش خلاقیت کودکان ارائه شده است و جهت تبیین موضوع، پنج نمونه از مراکز کودک در تهران به طور تصادفی انتخاب شده و نتایج به‌دست آمده از تحلیل‌های انجام شده در این مراکز، مورد بررسی قرار گرفته است. روش تحقیق براساس مطالعات کتابخانه‌ای و تحلیل محتوایی پیرامون مبانی نظری پژوهش موردنظر می‌باشد که با توجه به یافته‌های نوین در زمینه‌های روان‌شناسی محیط1، روان‌شناسی و طراحی معماری صورت پذیرفته است. Arnone, M. (2003). Using Instructional Design Strategies to Foster Curiosity. ERIC Clearinghouse on Information & Technology, Syracuse University. Azemati, H. (2008). Urban Park Design Principles Based on the Promotion of Children’s Creativity. Doctoral Dissertation, School of Architecture and Wisdom, Iran University of Science and Technology. Aziz, N., Said, I. (2012). The Trends and Influential Factors of Children’s Use of Outdoor Environments: A Review, Journal of Social and Behavioral Sciences, 38, 204-212. Bagheri, M., & Azemati, H. (2011). Physical Space as A Curriculum (Developing Children’s Creativity in the School Environment), Quarterly of Iranian Curriculum Studies, 22, 163-174. Balke, E. (1997). Play and the Arts : The Importance of the Unimportant. Childhood Education,73(6). Barker, J., & Weller, S. (2003). Geography of Methodological Issues in Research with Children. Qualitative Research, 3(2), 207-27. Beletsik, G. (2007). Kindergarten Architecture. (M. Saghafi, & S. Basirian, Trans.). Esfahan, Iran, Khak Publishing. Bell, A., Paul, C., Greene, T., Fisher, J., & Baum, A. (2001). Environmental Psychology. London, Lawrence Erlbaum Associates. Berlyne, D. (1960). Conflict and Curiosity. New York, Mcgraw-Hill. Bohm, D. (1998). On Creativity. Edited by Lee Nichol, Routledge. Crain, W. (2007). Pioneers of Growth Psychology. (F. Fadayi,Trans.). 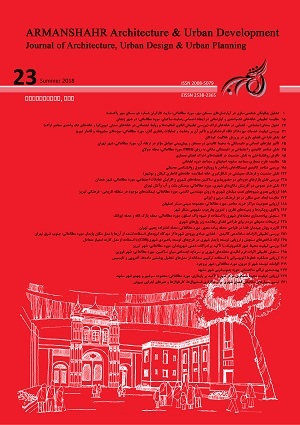 Tehran, Iran, Ettelaat Publishing. Davis, J. (2009). Involving Children. Researching with Children and Young People, Research Design, Methods and Analysis, London, Sage Publications. Erikson, E. (1963). Childhood and Society. W. Norton and Co; N.Y.
Eynifar, A., Izadi, A., & Gharebeyghloo, M. (2012). Typology of Research Methods in Children’s Environmental Studies. Faculty of Art University, 9, 87-103. Farhang, M., Hoseini, S., Bagheri, M., & Azemati, H. (2010). The Role of Open Spaces in Children’s Development and Creativity. Bagh Nazar, 4(8), 72-59. Fisher, R. ( 2005). Teaching Children to Think. Cheltenham, Nelson Thornes. Frumkin, H., & Fox, J. (2011). Contact and Nature. In Making Healthy Places: Designing and Building for Health, Well-Being & Sustainability, Washington, Island Press, 106-228. Gardner, H. (1982). Art, Mind and Brain: A Cognitive Approach to Creativity. New York, Basic Books. Gharebeyghloo, M. (2010). City and Child, City Responsibilities to Children’s Playground. Manzar Monthly, 10, 14-17. Good, T., & Broophy, J. (1990). Educational Psychology: A Realistic Approach. London, Longman. Guilford, J., & Hoepfner, R. (1966). Sixteen Divergent-Production Abilities at the Ninth Grade Level. Journal of Multivariate Behavioral Research, 1(1), 43-66. Hi Design (Eds). (2013). Kindergarten Architectureii. Dalian University Technology Press. Izadpanahe Jahromi, A. (2004). Child, Play and City, Process, Principles and Criteria for Planining and Designing Children’s Playgrounds. Tehran, Iran, Publications of the Municipality Organization. Krippner, S. (1999). Dreams and Creativity, Encyclopedia of Creativity. San Diego, Encyclopedia of Creativity, 1. Lubart, T. (1994). Thinking and Problem Solving. San Diego, CA, Academic Press. Mccoy, M., Evans, J., & Gray W. (2002). The Potential Role of the Physical Environmen in Fostering Creativity.Creativity Research Journal, 14(3, 4), 409-426. Mehdinejad, J., Damavandi, M., Siroossabri, R., & Abbaspouasadolah, J. (2012). The Impact of Natural Gaming Environments on Children’s Education. Journal of Educational Technology, 4, 297-304. Mehrabian, A. (1976-77). A Questionnaire Measure of Individual Differences In Stimulus Screening and Associated Differences in Arousability. Environmental Psychology and Nonverbal Behavior, 1(89). Moore, R., & Marcus, C. (2008). Healthy Planet, Healthy Children: Designing Nature into Daily Spaces of Childhood, In Biophilic Design, The Theory, Science and Practice of Bringing Buildings to Life, By S.R. Kellert, J.H. Heerwagen & M.L. Mador, 153-203. Noghrekar, A., Farhang, M., Bahram, S., & Shafayi, M. (2009). Preschool Space Design Based on the Relationship between Creativity and Architectural Attributes. Quarterly Educational Innovation, 8(32), 39-59. Oches, R. (1990). Before the Gates of Excellence. New York, Cambridge University Press. Piaget, J., & Inhelder. B., (1969). The Psychology of the Child. Paris, Universities De France. Piaget, J., & Inhelder, B. (2009). Child Psychology. (Z. Tofigh, Trans.). Tehran, Iran, Ney Publishing. Shibata, N., & Suzuki, N. (2004). Effect of an Indoor Plant on Creative Task Performance and Mood. Scand G Psychol, 45(5). Seif, A. (2004). Breeding Psychology (Psychology of Learning and Teaching). Tehran, Iran, Agahpublishing. Seif, S., & Karaminouri, R. (1996). Growth Psychology. Tehran, Iran, Organization for the Study of the Books of the Humanities of Universities. Sternberg, R. (1988). The Nature of Cretivity: Contemporary Psychological Perspectives. New York, Cambridge University Press. Sternberg, R. (1999). Handbook of Creativity. New York, Cambridge University Press. Sternberg,R., & Lubart, T. (1995). Defying the Crowd: Cultivating Creativity in a Culture of Conformity. New York, Free Press. Sternberg, R., & Lubart, T. (1995). Investing in Creativity. American Psuchologist, 51, 677-688, Guiding Creative Tallent, Englewood Cliffs, N. J., Pretice -Hall Torrance, 196. Sullivan, W., Kuo, F., & Depooter, S. (2004). The Fruit of Urban Nature. Vital Neighborhood Spaces, Environment and Behavior, 36(5), 678-700. Sutto, E., & Kemp, S. (2002). Children as Partners in Neighborhood Place Making. Lessons from Intergenerational Design Charrettes, Environmental Psychology, 22, 171-189. Tabatabaeian, M. (2004). Making a Test for Teachers’ Attitude Towards Creativity. Thoughts and Behavior, 10(1, 2), 100-109. Talayi, M. (2011). The Language of Colors in Children’s Biological Space. Architecture and Culture, 13(46), 53-56. Tamdogon, O. (2006). Creativity in Education: Clearness in Perception. Vigorousness in Curiosity, Education for Information, 24(2- 3), 139-151. Torrance, E. (1968). A Longitudinsl Examination of the Fourth Grade Slump in Creativity. The Gifted Child Quarterly, 12, 195-199. Torrance, E. (1993). The Talent for the Creativity of their Test and Development. (H. Ghasemzadeh, Trans.). Tehran, Iran, Donyaye No Publishing. Trevlas, E., Matsouka, O., & Zachopoulou, E. (2003). Relationship between Playfulness and Motor Creativity in Preschool Children, Routledge. Part of the Taylor & Francis Group, Early Child Development and Care, 173(5). Wang, D., & Wang, S. (2013). Play, Indoor & Outdoor. Di1 Ban, Dalian, Basheer Graphic Books.